The National Institute for Health recently released the results of the longest and largest weight loss maintenance study conducted. The results – not terribly astounding in my opinion. The support of personalized counseling outranked web support and self-guidance in sustaining weight loss over a period of two years. Why would phone counseling be the most beneficial? All I can offer is my own theories and experience. Human beings are social creatures. As a species we have learned to rely upon and connect with one another in order to survive. Those who come to me after trying to go solo are frustrated, confused, and de-motivated. Receiving personal support allows the individual to receive what they need, when they need it. This is something the media or a book simply cannot offer. Often there are also struggles with following a healthy food plan when the social circle one is interacting with is not committed to such a lifestyle. The individual then must make the choice of isolating to stay on the diet or socializing and risking falling off the plan. A healthy lifestyle is very difficult to sustain without at least one other individual committed to supporting it. Simply put, our culture is not set up to sustain health without a great deal of support and some savvy, defensive eating skills! Web support touches on some individual needs, but what is missing is the subtle nuances that enhance communication; rapid exchange of ideas or needs and tonal inflection which can indicate that there are deeper issues to be explored. When on the phone or in person, these subtleties are not hidden behind text. The counselor and counselee can establish a deeper bond through an “I hear you, I see you” type interaction that is much more difficult to obtain via the internet. This multi-sense communication will enhance results through a stronger bond between the two parties, and an ability for the counselor to pick up on subtle cues which may be missed over email. If you feel frustrated with going it alone, confused about the conflicting messages of the media, or are ready for additional support to meet your health goals, consider reaching out for additional support. It’s only natural, and studies show it’s the most effective way to get the job done! With the weather cooling considerably and the days shortening, my bones have been aching for some steel cut oats. Not just any steel cut oats, but my tea-soaked steel cut oats (a genius discovery last winter). Steel cut oats have staying power far superior to oatmeal and provide all the benefits of whole grain oats in a thick, warming porridge with more substance than Quaker will ever have. The problem with steel cut oats (and why most of you have never had them) is cooking time. I certainly don’t have 45 minutes in the morning to stand over a stove and cook fresh oats! 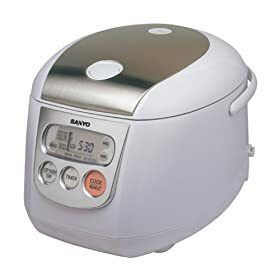 I pondered a plausible solution — if my rice cooker can cook and keep rice warm, can it cook and keep oats warm? Answer: YES! A resounding yes! Aside from my Vitamix, the kitchen tool that makes me the happiest is the Sanyo ECJ-D100S 10 cup rice cooker. It will cook and keep rice warm until gone. Period. How ever many days it takes, you will have hot rice. It is the modern kitchen maven’s secret to easy, available whole grains. I’ve made brown rice, wild rice, and oats in mine. I can use the keep warm function to keep quinoa and other quicker cooking grains hot and ready when I want them. I wake up every morning and have hot whole grains in my bowl in less than 45 seconds. It’s the next best thing to being fed by family. A million-and-one thank-you’s to Katie O. for informing me of Google’s delectable new online satellite pedometer! Now outdoor athletes can route favorite city runs, determine speed and distance, and download, save or export these routes! There is even an elevation tracker and (inaccurate) calorie counter. Maps are available for all 50 US States and Puerto Rico. GMaps Pedometer — it just might be better than Christmas! Try Sanoodi as well to keep all your local routes in one handy spot.